Our cellar is equipped with a refrigeration system connected with insulated tanks and a heat transfer plate by which it is possible to control the fermentation temperatures of must. 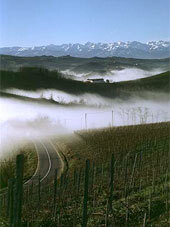 In this way the best wines are produced, with elegant and pleasing aromas. Moreover, lowering the temperature below 0° C for a few days, it is possible to obtain the tartaric stability of wines in order to prevent or reduce possible precipitations in the bottled product. Precipitations occur as a result of lowering of temperature. The different processes, from crushing grapes to bottling wine, including the stocking, are made with equipment and tanks in stainless steel in order to ensure the best hygiene and healthy conditions. As regards the aging of those wines which requires a particular aging period (Nebbiolo and Barbera superiore) we use oak barrels. Inside the cellar you can find a tasting room where you can personally evaluate the quality and the authenticity of our wines. By our wine farm, located at an altitude of 500 meters above sea level and to ten kilometres far from Alba, you can admire the amazing landscape of Langhe with its hills and castles which overlook the surrounding vineyards. During sunny days it is possible to see the entire western Alps dominated by the peaks of Cervino, Monte Rosa and Monviso. Montelupo is a small hillside community, of mediaeval origins, with a traditional economy based on agricultural activities and supported by an increasing development of tourism. Most of the "montelupesi" inhabitants, with a high number of elderly, live in the municipal capital; the rest of the population is distributed among several scattered houses. The land has an irregular geometrical shape with strong variations of altitude, which ranges from a minimum of 240 to a maximum of 594 meters above sea level. The village stands in an elevated position along the crest of a spur which divides the valleys. WHERE IS AND HOW TO REACH IT? It extends in the North-East of the Province between the valley of the Talloria stream and the upper basin of the Cherasca stream, in the low Langa.. It is easily reachable from the main road n. 29 of Cadibona pass; and it is just 40 km from the toll booth of Ceva of the A6 Torino-Savona motorway. 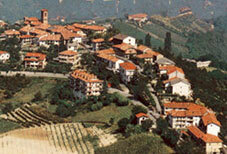 The for the railway station, on the railway Asti-Cavallermaggiore, it takes only 13 km away. The distance increases significantly if you want to reach the terminals of the air or maritime traffic: the airport of Cuneo/Levaldigi is 50 km away; the airport of reference, for national and international flights (Turin), is 115 km away, whereas for direct intercontinental flight the terminal of reference is Milano/Malpensa, 187 km away. The port is 72 km away. It belongs to the commercial and tourism paths, and as regard the bureaucratic and administrative requests that cannot be fulfilled on site it is supported by the city of Alba. The name is made up of the noun MOUNTAIN, which refers to the elevated position of the settlement, and to the proper noun LUPUS. The mediaeval documentation preserves evidence of a "villa Montislupi". The origins of the borough date back to 1200: here the inhabitants of the mysterious Uriolo would take refuge. Uriolo was a powerful stronghold and stands in the lands between Guarene and Piobesi d’Alba but we have no traces of it, although historical documentations of Alba mention it until 1400. The borough has been fief of Alba and it has followed its fortunes for better or for worse. When the Gonzaga family became Lords of Monferrato, it was transferred to the Mombaruzzo family: then it was transferred to Malvasia family, to Rangone family, to Cecilia Zocca and to Giacomo Pietro Portoris. Among the historical and architectural evidences are present: the parish of Santa Maria Assunta, opened for worship in 1764 and consecrated in 1770; the church of Battuti, of Romanic origin; finally, the chapel of Oriolo of rural shapes. Near the farm, the Chapel of Oriolo, destination of traditional pilgrimages during last centuries; in ancient times, on the top the castle of the Counts Rangone was built by a famous family of old Piedmont; one of them, the architect Carlo Francesco built in these lands numerous churches and palaces in great Piedmontese Baroque style.